As a phrase it’s simple and short. You can pack so much into short phrases. In Shakespeare’s ‘King Lear’, the pivotal moment in the whole play is written as just ‘He died’. There’s no how or why or wherefore. No big announcement or speech. No high drama. Just two words. it’s four words, granted, but in the upper reaches of the North Pennines it says so much. In any normal winter it would mark the end of it. A return to normal and the reassurance that everything will be OK again. With the numbers of curlew and lapwing and oystercatcher and redshank on the ever decline in the North of England, it marks something of a sigh of relief to hear those first whirring, bubbling, almost alien calls echoing around the fells. Hearing those sounds also reminds me I’m in the Upper Dale, which is where I got to after leaving Cronkley Bridge. Heading ever onwards, downstream towards the distant sea. Today the river level is up a bit and the water is running at a fair pace. Not quite in spate, but in a decided hurry nonetheless. Following the Pennine Way, the path is well marked and maintained, but moves away from the course of the river as it swings right and left and right in big sweeping curves beneath Dime Holm Scar. Up on Bracken Rigg the path flatten out to a brief plateau and the gentle mounds of a bronze age settlement. The path next meets the river just before the crushing plants of High Force Quarry loom up on the opposite bank. A still very active whinstone quarry, it’s a present reminder of the industrial activity that’s shaped all of the landscape around here. This now barren and wild landscape bears the marks everywhere of centuries of mining and quarrying and the wealth and poverty of those that came to make their fortune from what lies beneath the surface. But the landscape is vast too, and easily swallows up the industrial workings. A mere dot on the wider view. And opposite, barely visited and overlooked by the rumble of machines and steel and rubber tyres, is one of the most spectacular waterfalls in this part of the Pennines. Bleabeck Force is the final leap where two becks from way up the fell meet and tumble down in a race to get to the river. From the Tees there is a small concrete beam bridge that gives you a view up the lower cascades and the top of the highest one. A short scramble over the boulders rewards you with a great view of the main fall and plunge pool below. The water levels on these fellside becks and gills are fickle and I’ve walked past this many times and never seen it look quite so spectacular. I’ll definitely make the journey up on a spate day. Back at the Tees, the river is still in a bit of a hurry. Skipping over the rocky bed which itself is becoming increasingly jarred and jagged with much larger outcrops appearing to grow up from the river bed. These angular intrusions breaking up the flow of the river and churning it white and chaotic. A quarter of a mile further on the river meets a wall of whinstone and is forced into a narrow channel down one side. The full width of the river – maybe 10 metres or more squeezed into a gap no more than a metre in places. here the water shows it’s true potential. You sense it’s speed and sheer will power. Then with one last twist and pirouette it leaps. and over a 35m vertical drop. In one, two steps. As it collides with the pool below, large quantities launch back up against the incessant downforce. This is High Force. The ‘biggest’ waterfall in England. I’m not sure how they quantify these things. It’s not the highest or the widest, but when in full flow it certainly has the largest volume of water per metre drop. Or something like that. Well, it’s impressive and it’s the biggest tourist attraction in the upper dale. There’s two ways to see this. From the carpark beside the High Force Hotel on the main dale road there’s a very attractive path that leads down the steep gorge to the base of the water falls for a few pounds entrance. Here you get to be as close as you’d want to get o experience the full power of the falls. When it’s in full flow the spray can be so much it’s difficult to see the falls. But the sight of that much water in full motion and the continuous roar is a real experience. Alternatively, from the Pennine Way on the other side of the river, you can get scarily close to the very top of the falls and watch the water disappearing down to the river below. Further downstream, there’s a little path off the main route that takes you to a small, unmarked viewing clearing where you get to see the whole waterfall in it’s full glory. And this one is free. Breaking yourself away from watching the waterfall, the path continues through a very ancient juniper forest while the river runs through a steep wooded gorge below and largely unseen for about a mile. The path meets the river again at the next bridge. It’s bridges we’ve really come to see and this is a fine one. Holwick Head Footbridge links the main Teesdale road with Holwick Head House and the track down towards Holwick village and the Earl of Strathmore’s estates. Upper Teesdale is split into two major estates – to the north is the Raby estate of Raby Castle and the ownership of the Lord Barnard. It can be distinguished by its whitewashed buildings and dark blue paintwork. To the south of the river at this point is the estate of the Earl of Strathmore who has a country house at Holwick Lodge. Holwick Head Bridge marks a link between the two estates and was originally built by the then Duke of Cleveland in 1896 and was known at the time as the Duke’s Bridge. It was rebuilt as a single footbridge by Durham County Council in 1998, but still retains the rather grand cast iron gateposts of the original bridge made by Motley and Green of Leeds. It’s a simple steel girder construction over a central stone pillar with wooden decking. It’s a popular bridge with walkers making circular trips along the river, or just as a stopping place to stand and watch the river run below. But its still only a footbridge. The first proper road bridge across isn’t for another six or seven miles yet which makes you realise just how isolated the south side of the river is. These bridges may be few and far between, but they’re vital for getting around this landscape. From the top of the bridge the river is busy on its way and largely ignores the passing of people overhead. It may have lost some of its width since High Force, but it’s lost none of its sense of purpose. There’s no slowing down or pausing to catch a breath. It will need all its energy to get past the next bit. Yay! it’s raining. At last. With daily reports of flash-flooding and thunderstorms from the rest of the UK and the Glastonbury Festival declared the muddiest for years, the most our Teesdale weather could muster has been the occasional half-hearted drizzly shower. While I’m not complaining about the weeks of sunshine, heat and beautiful walking weather, now the rain has arrived it brings with it that distinct summer aroma of wet grass, and a burst of life from the ground. The air is suddenly alive. Some things are better in the rain. The River Tees is really low at the moment. The waterfalls of Upper Teesdale are little more than a trickle at the moment. Here’s Summerhill Force dribbling over Gibson’s Cave last week. Compare that to the day after Storm Desmond visited on the 5th December last year. OK. So this is a bit of an extreme example. But extreme things do happen. It’s 200 years ago this year that we had a ‘Summer that never was’. A year when the world was 0.7 degrees colder than normal, harvests failed and populations starved. In April 1815, in Indonesia – 8,000 miles away – the sleeping giant volcano Mt Tambora erupted. The explosion was so large it was heard over 2,000 miles away in Sumatra. The volcanic dust cloud enveloped most of the planet causing severe climatic events throughout 1816 and affecting weather patterns for years after. In North America, hard frosts were recorded right through July and the Eastern seaboard experienced a perpetual fog that lasted through the summer of 2016. In Northern Europe, the long winter extended into a very wet summer causing crops to fail. Throughout Europe food became scarce and there were violent uprisings outside government buildings in several countries. In Ireland, the failure of crops marked the start of the ‘Potato Famine’ and over the next 3 years over 100,000 people died. Freak events that shaped our world 200 years on. In July 1816, JW Turner visited Teesdale on a long, extended painting tour of the North of England. He stayed at Barnard Castle and Middleton-in-Teesdale on a particularly wet week as he ventured right up the dale. By the time he reached Cauldron Snout it was really throwing it down. 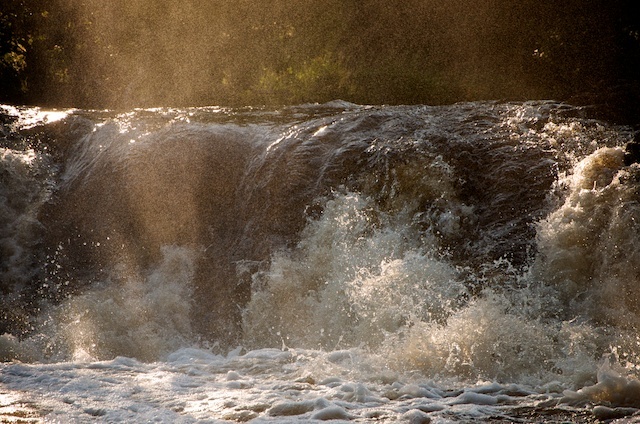 However, he did manage to see the falls of the River Tees at their best – full and lively. It was the subdued light from the volcanic ash cloud that summer, along with the incessant rain which gives Turner’s painting from that trip of 1816 the substance and atmosphere that Ruskin claimed was Turner’s most effective work ever. I’ve lived in Teesdale now for two years. Two years this very week. I love living here. I love having the river just yards away from from my house – so close on still nights I can hear it falling over Low Force from my bedroom. I’ve spent so many days down there and walking up the river towards High Force and the fields, woods and fells on either side. However, I don’t really know Teesdale, let alone the wider County Durham. A couple of weeks ago I made a conscious effort to get to know where I now live. It was another warm and dry afternoon, and a rare weekend off from working so I thought I’d make a start to discover Teesdale properly. Having poured over books and walking guides and maps, and old OS maps and Gogle Earth, I decided to start where Turner started – at Greta Bridge on the Durham / Yorkshire border. I knew about the temperamental River Greta from a previous project further up its course, but I’d never been down towards where it joins the River Tees. Greta Bridge was a popular spot in Turner’s day. the old road over the Pennines via Stainmore started here at the significant coaching inn of the Morrit Arms. In Turners day there were still remnants of the Roman fort there. Clearly a strategic point where the route from East to West ascends up and over the wilderness. Crossing the Greta is crossing to another world. Greta Bridge and nearby Rokeby Park became important sources of inspiration for a generation of writers and painters. Besides Walter Scott who immortalised the area in his own seminal work, the place was a key destination for the Wordsworths, Dickens, Coleridge and most of the Bloomsbury set. The landscape here is wider. 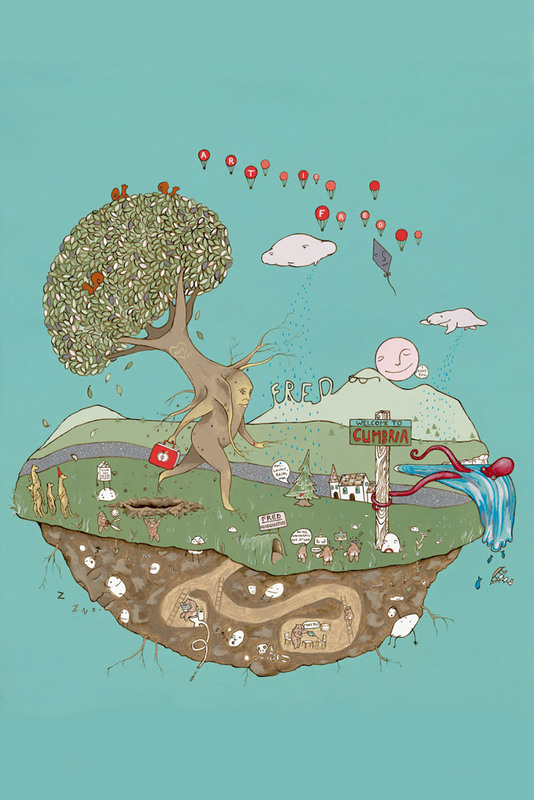 It’s greener and rolling and fertile and hospitable. And distinctly arable. A very different kind of greener. A short walk up the Greta brings you to the ruin of St Mary’s church in Brignall. Nestling in the bottom of the valley. There’s not much left of it now. The new church was built further up the hill in the second half of the 19th Century and reused much of the stone from from the old church. Turner’s view of the church reveals much about attitudes to landscape in the early 19th century. It’s actually a remnant of the trend of 18th century landscape attitudes – where hills were so dramatic as to be scary: “it was almost the whole duty of all hill scenery to inspire alarm, and every painter who wished to give a good impression of any particular place always painted it as if it were twice its real size” to quote one of Turner’s picture editors. It’s also a view point that doesn’t actually exist, again to increase the visual impact. The large tree in the foreground is one sketched in Rokeby Park. Topographic accuracy wasn’t important in the appreciation of landscape in 1816. What mattered most was conveying the essence of place. These were places most people would never see in real life so were designed to excite the imagination of the viewers. Of a place that is of somewhere else. The early tourists came to gawp and the awe and wonder of the place and the people that went before, conjuring up stories to populate somewhere new and unknown. Things have changed so much in the intervening two centuries that it’s hard for us to begin to understand how people viewed the landscape of Teesdale. So much changed with the invention of photography that we can only know what somewhere really looks like. The visual and emotional impacts are much more subdued and taken for granted. They smelled so good, I went home and had them on my pizza. Success. It’s a great concept, but what do you mean by success? Sure fast cars, big houses and pots of cash can be a fair indicator, but success can exist at all levels – like when your Yorkshire puddings rise evenly or when you put a piece of IKEA furniture together and you don’t have any pieces left over. But what about art? When would you consider yourself a successful artist, or even how do you measure the success in an artwork? These are the kind of things you have to evaluate for funding reports and consultations. Stuff I don’t like doing and generally try to avoid, mostly because it’s full of questions like this. 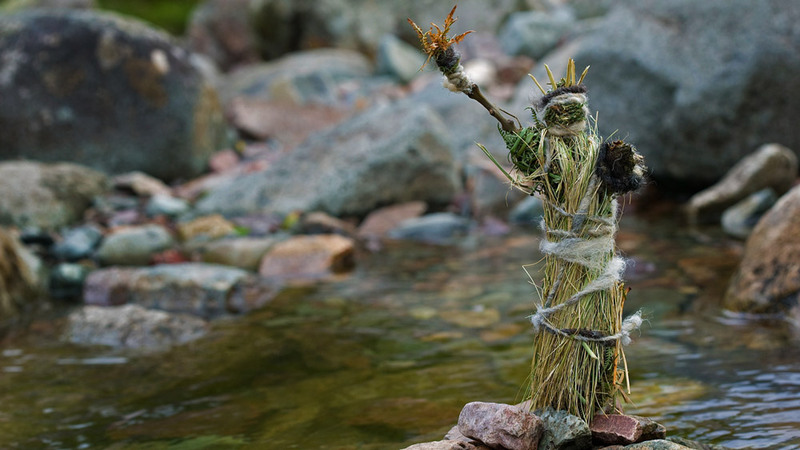 Sure, last year’s PaperBridge in the Lake District seemed to be a success. It went up and stayed up. It even went down well with visitors attracting nearly 10 times what I’d anticipated. Pictures of it went around the world and it appeared on TV on four continents. That’s pretty successful isn’t it? Well, if being popular with the general public is the measure of success then yes. But as a work of art, how do we measure success for that? Did it do all the things art needs to do? I’m not sure how we work that out. I’m quite sure it didn’t fail though. That’s a different thing. One recent TV interview asked me about risks involved in putting up a bridge made of paper. In particular they wanted to know how sure I was that the one in China would take a car going over it. The honest answer to that was I wasn’t sure. It had never been done before at that scale so how would anyone know? In fact there was a very real risk that it wouldn’t work. It could so easily have failed and collapsed and trashed a £100k car. Sure we took lots of precautions and did lots of complicated calculations. We even enrolled a world leading structural engineers to check it all over with the latest hi-tech computer modelling. But at the end of the day they had to admit there were too many unknowns involved in building big structures out of sheets of paper – a material not made for building bridges out of – to sign it off as safe. In short – no one knew for sure it was going to work. On one level the risk-taking was part of the deal. That element of peril was part of the narrative. If it was easy it wouldn’t have been as big a deal. If it was easy someone else would have done it before, I’m sure. Actually, as I’d built a bridge before I kind of knew how they behaved and was sure it’d be fine, so I probably over did the risk bit for dramatic effect – but I certainly didn’t tell the client. What was important was that everyone involved was aware of the risk and was happy to take that risk with me. There’s a real element of risk in all my projects. Someone once said to me – if you have a 100% success rate, you’re not taking enough risks. When you’re pushing at the boundaries of things, that’s where the excitement comes in and if you manage to pull it off then that’s where great things can happen. In that respect, the opposite to risk and success is mediocrity. There’s nothing more dangerous than playing it safe. Taking the easy road. That’s where things get stuck or become so half baked they start to deteriorate into something much much worse. Failure on the other hand isn’t so bad. Every now and then I have a project fail in me. More often then not it’s at such an early stage no one ever knows. I’ve lost track of the number of times projects I’ve been asked to get involved with have failed at the proposal stage. Some don’t even get that far. Mostly these are because the client doesn’t want to take a chance. Play it safe maybe. In which case, they’re just not the people I want to work with. Occasionally a project will get all the way to the final piece and then fail in spectacular style. That’s a different issue. I once had a high profile piece that was supposed to be up for 5 months, however it blew away after 5 days. Still, it went in if only for a short while, and even led to a chapter in a large international publication about just why it failed – the reasons were really interesting. I’m not sure the client saw it that way mind. And then there’s the times that failures aren’t really failures. ‘Metropolis’ – the fritz Lang cinematic masterpiece. The first film with a final budget in the millions. It was only ever shown at one cinema before being deemed a flop by the studio. It was subsequently re-edited to a shorter story in an attempt to reclaim the costs. Schubert never heard any of his symphonies performed. Very little of his orchestral music was performed at all during his lifetime, yet his ‘Unfinished’ symphony is now regarded as one of the greats of its time. More recently, Anish Kapoor’s ‘Orbit’ became the victim of a playing it safe mentality with the producers and suffered from an incursion of mediocrity that has now extended to installing a helterskelter slide down it. I think time is yet to decide on that piece. If I’m being brutally honest, I think there are problems with most of my pieces. There’s always something that doesn’t go to plan or work out quite how I wanted it. However, in most cases these are things other people generally don’t notice. Or I make a feature of them. That line between success and failure is so fine. So delicate in fact it’s barely there. Or at least not so you’d notice. Good things come to those who wait. Patience is a virtue. Cliché cliché maybe. I’ve had my fair share of mad, short timescale projects. Some so short they almost felt like instant pop-ups. 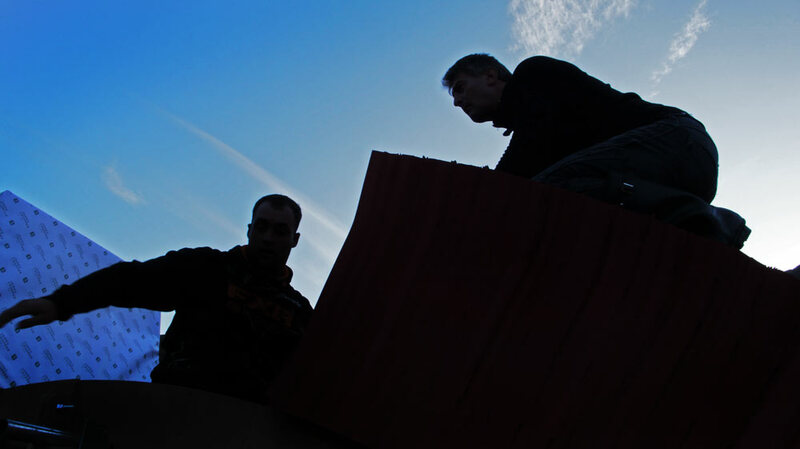 ‘Level’ in Peterborough earlier this year was devised and realised in 30 days. The ‘Paviljong’ in Sweden was a 14 day project, while ‘Souvenir’ in Shanghai in 2006 was less than 10 days from concept to finished pieces. Pieces like this are born and raised on adrenalin. It’s the only way. My latest project, on the other hand comes from the opposite end of the timescale spectrum. ‘PaperBridge’ has been hanging around my life on and off for nearly five years, but a couple of weeks ago it finally became a reality. 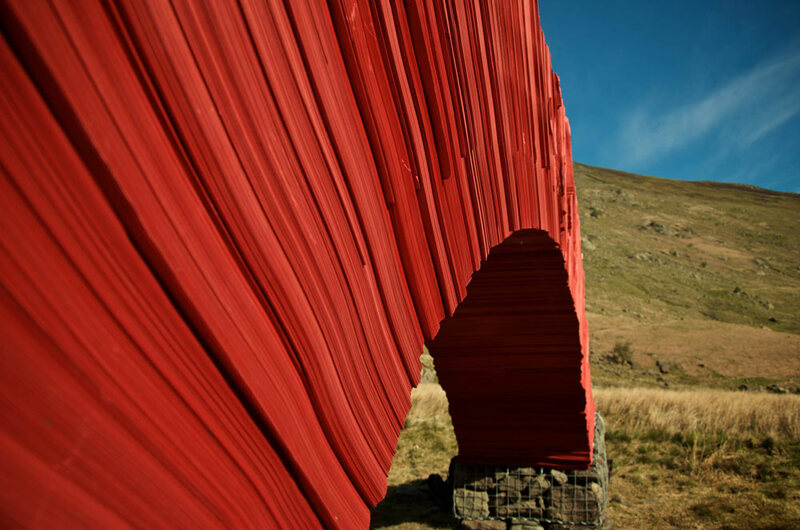 Around 22,000 pieces of paper arch over a beck at the foot of the Helvellyn range in the English Lake District. The bridge weighed over 4 tonnes and could support the weight of 60 sheep (if you could fit that many on it), yet it didn’t use any glue, nuts, bolt, screws or any other fixings. It was just pure paper wedged between two cages of stone. Despite the long gestation period, it’s still felt a bit of a whirlwind project and the last two weeks of my life have been some of the craziest in a long while. The bridge is in a fairly remote valley in the Lake District. 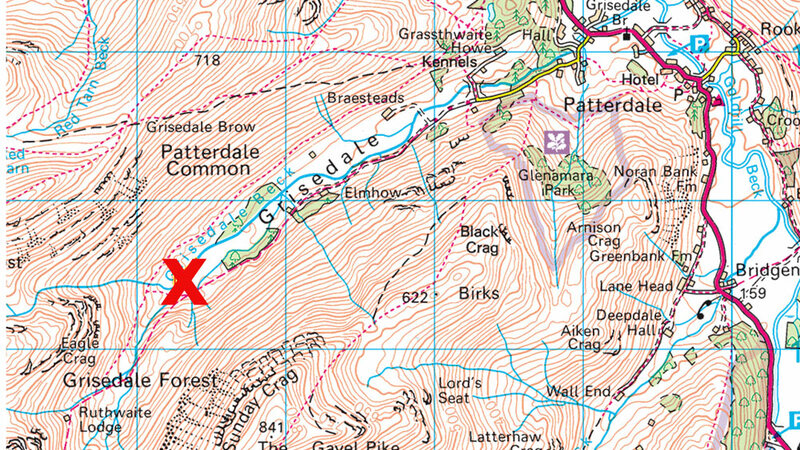 The nearest village is Patterdale at the south end of Ullswater. Getting to the village from anywhere else requires either a long winding journey down the length of the second longest lake in England, or up and over the Kirkstone Pass – one of the steepest mountain passes in the country. From Patterdale (population 400) the bridge is a good two mile walk up the Grisedale Valley. A mass-tourist destination it isn’t. Because it’s a bridge made only of paper I wasn’t sure how well it would take to thousands of people crossing it, so I put it in a place where I thought not so many people would venture. 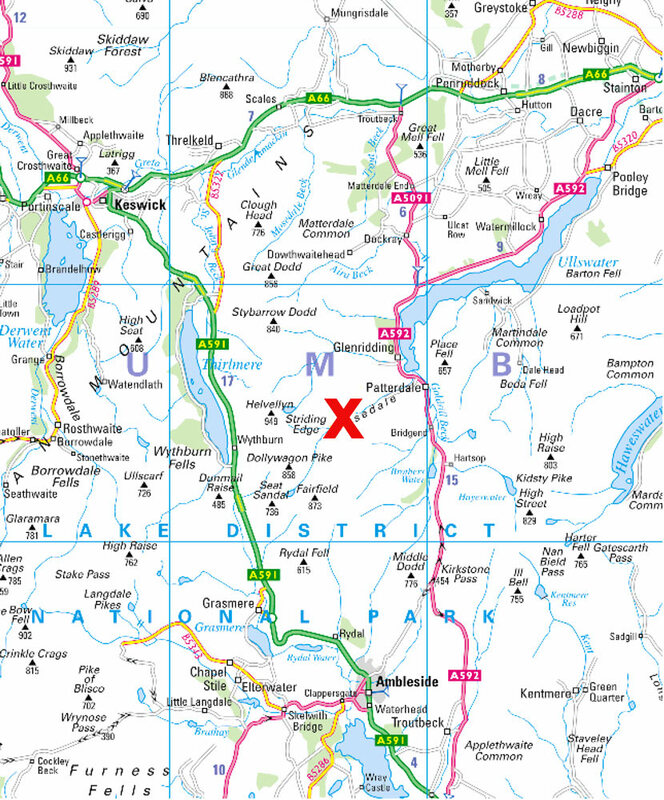 It’s on the main Coast to Coast long distance path and there’s a nice 5 mile circular from the Ullswater villages, so it would get passing visitors OK and maybe the odd person venturing out just to see it. I’d allowed four days for the install incase of bad weather and to have some breathing space. I’d got a good team to hep build – Phil had helped build an earlier test piece, Ewan and Michael built drystone walls in Teesdale together (Ewan was also part of the God’s Bridge project a couple of years back), and there was Li – a second year architecture student from Newcastle. It was a pretty simple build once we got started so it should all be straight forward. 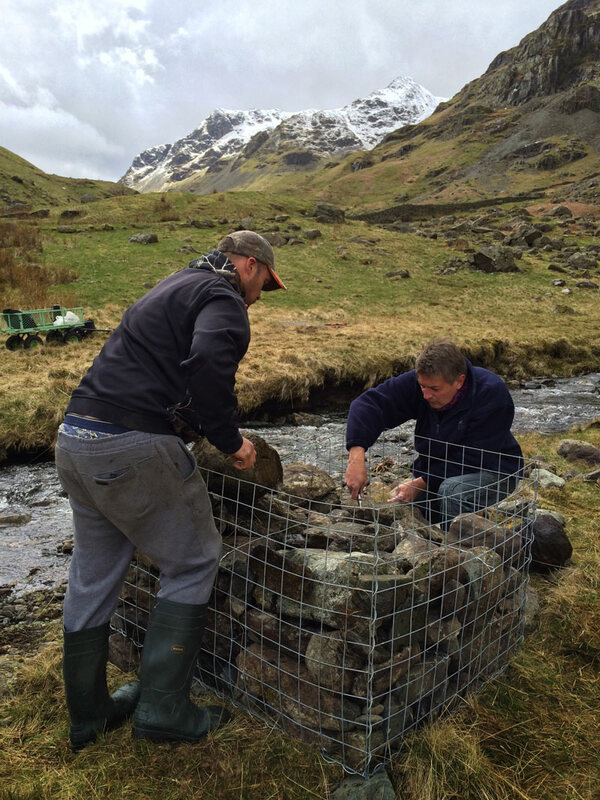 Michael and Phil had built the gabion abutments the week before to give them time to settle. There was a fresh fall of snow on the fell tops that day. Walking up the track towards the valley head those rocky peaks looked the daunting mountains they really are. This was the wild Lakeland landscape I was after. Not the bit most of the 16-million tourists who visit the Lakes each year see. The shocking statistic is that around 95% of visitors to the Lakes don’t travel further than 80m from their cars. I’ve seen them down at Bowness on Windermere cooing over the water and boats, eating ice cream and happy to be in ‘The Lakes’. Chiang Yee had seen the same thing back in the 1930’s. It hasn’t changed. But for me, those mountains. Those scary crags are what have really shaped the western idea of landscape. Writers, thinkers, poets and artists have been inspired by these distant, towering rocks over the past 200 years. Their names as old and layered with hinted stories as the art they inspire – Dollywagon Pike, St. Sunday Crag, Pinnacle, Striding Edge. The stream the bridge crosses – Nethermost Cove Beck – its name littered with the remnants of a Viking past. It had been a glorious April on the whole and every site visit I’d made this year had been still and sunny. It lulled me into a false sense of security. The Cumbrian weather had other ideas come May. The first day was due to be just getting materials onto site. I’d arranged for all the paper and the wooden formers to be delivered on the same wagon so that everything could be carted up the track by tractor in one go. By the time the delivery wagon arrived it had been raining for over 12 hours non-stop. We knew this was no longer going to be as simple as we wanted. I followed the wagon up the narrow and steep track to the farm in the pouring rain, grateful that finally things were arriving. Only to discover that instead of 7 pallets with 4 tonnes of paper, there was only two pallets to unload. With no mobile phone signal in the valley I left the the farmer to cart what was there up as near to the bridge site as he could get and the team to move it the last bit by hand while I went off to sort the case of the missing consignments. By the time the rest of the materials were delivered the next day so much rain had fallen in the valley that the farmer couldn’t get a tractor anywhere near the bridge site. A frustrating 24 hours where we could do no more than check into the cottage I’d rented for the team and twiddle our thumbs. By 7am on day three the sun was out and the wind had dropped. After fuelling on breakfast butties and tea we got an early start on things. First task was putting together the flat-packed plywood former that the bridge was to be built over. 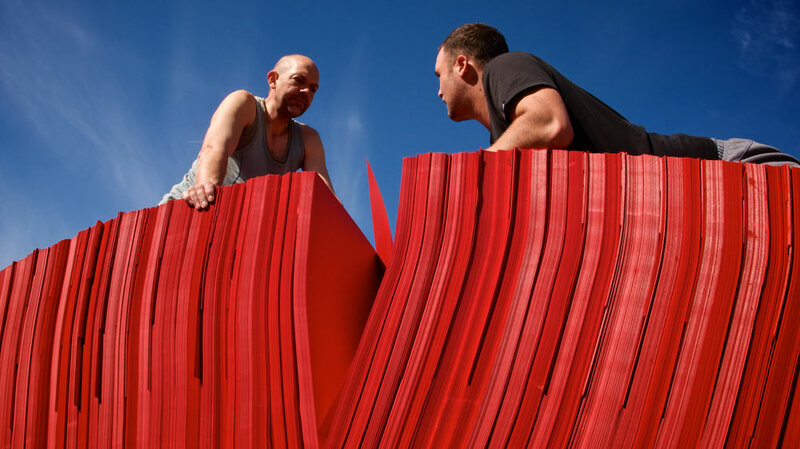 The form was designed with Peter Foskett who’d previously worked on the ‘Seven Spires’ piece back in 2011. The former was designed in two halves and precision cut by CNC machine in Carlisle. The form was held together by pegs cut from the same sheets so the whole thing could be assembled without tools. The form was then supported on screw jacks and acrow-props between the abutments. One of the key secrets in the formwork design was the way the two halves could be jacked-up in the middle to help get the final pieces of paper in and keep the compression high across the arch. 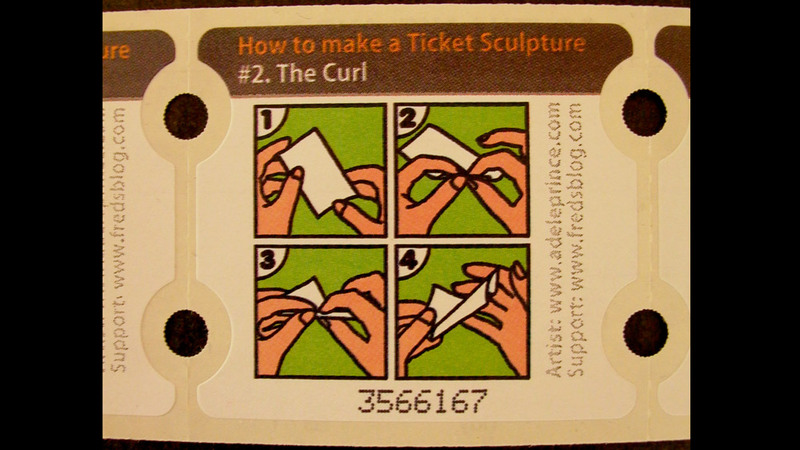 Once the former was in, it should then be a simple process of stacking the paper over the top. Two packs of paper followed by a wedge made of smaller sheets – the size and quantity having been predetermined in the design process. Nice and simple. Only the paper was in packs of 100 sheets – each sheet measuring 900mm x 700mm. Each pack weighing 17kg. And ALL the packs were on pallets over 500m the other side of a bog. The only way to get the paper onto the site was to carry them by hand. All 168 of them. This wasn’t going to be a quick process. Paper that size and in those quantities isn’t an easy thing to handle. Once out of their protective wrapping the packs quickly lose their shape and rigidity. What started out as a one person job to stack the paper became a five person task by the end of the day. As the day progressed we got slicker at building and got into a rhythm. The weather continued to improve so we kept going while things were in our favour. But by 8pm we were exhausted. Twelve solid hours hefting large packs of paper around was enough. Elm How was a great base for the install team. A huge traditional farmhouse with amazing original flagstone spiral staircase, it was large and comfortable and quiet. And only 15 minute walk up to the bridge site. Surrounded by fields of pedigree swaledale yows with their newborn lambs and shorthorn cattle calving in the barn next door, by night it was all stars, hooting owls and wandering badgers. Its isolation came with disconnection from the rest of the world – no mobile signal, no internet. On a morning when the rest of the country was waking to the aftermath of the general election, we were blisfully unaware of any of it. And it was lovely. 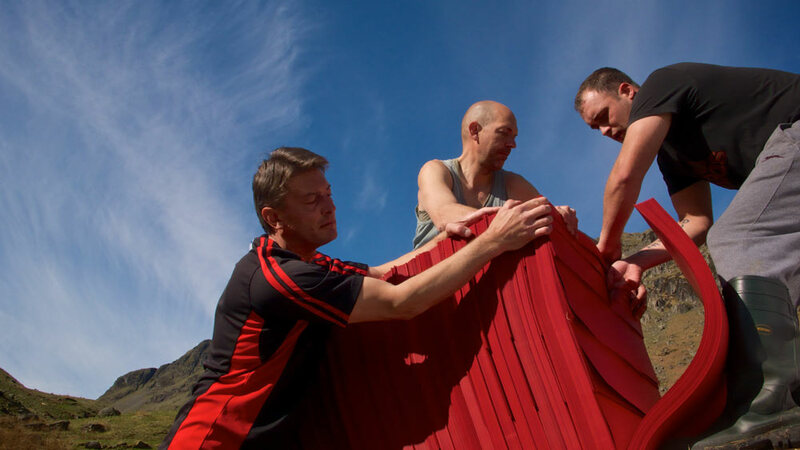 My original plans had been to build the bridge mid-week and if we got ahead of ourselves we’d just wrap it up in tarpaulins until the Friday morning. There had been a fair bit of media interest in the bridge over the previous week or so and I’d booked a minibus to bring people halfway up the track for the press launch. The 16-seater bus had already been over booked with photographers and at least two different TV crews. However, on the Thursday night I’d driven down into the village to pick up some leaky wifi to send some emails and discovered that every single press photographer and TV crew had cancelled at the last minute to do vote counts. So press launch was to be a no press launch. At least the pressure was off. We just had to get the bridge built by late morning in time for whoever decided to still come on the bus. As the final pieces were being hammered into place as small crowd was gathering on a rocky outcrop on the other side of the bog. The couple staying in the cottage behind Elm How had also come down to lend a hand. The plan to raise the centre sections up to get the last pieces of paper in didn’t quite work to plan as the acrow-props were being jacked further into the river bed rather than lifting, so the final pieces were done more with brute force and heavy whacking. By the time the wooden formers were lowered and slid out there was a fair crowd gathered along both sides of the beck. 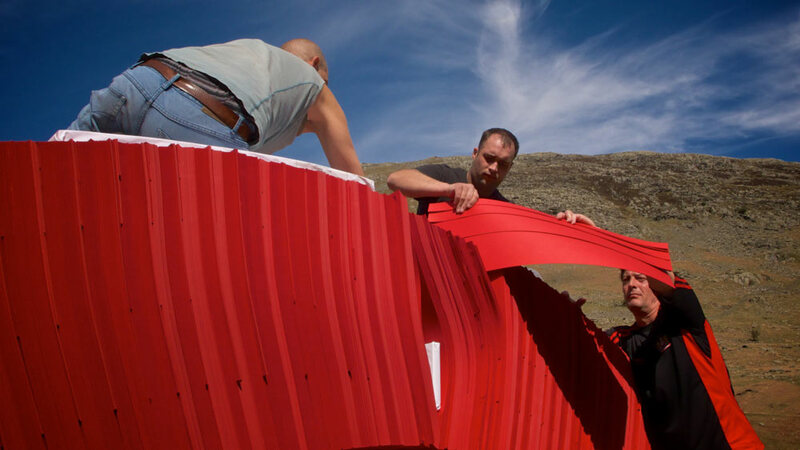 a loud cheer as the final piece was removed and the pure red arch remained leaping over the water. I had expected the arch to sink a little at the top as the formers were lowered, but all that hammering and wedging the final pieces paid off and it didn’t move a jot as one side then the other was gradually lowered and I could see daylight between the paper and the plywood. Despite the nearly five years of development, the many scale models, the months of testing in all weathers, and the long hours designing every last millimetre – that sense of relief when finally those thousands of sheets of bright red paper finally stood there on their own was immense. It’s that time of year again. The crowded summer is definitely over and the year is slowly winding down. The leaves are just at the turn of colour – give it another fortnight or so and those golds and reds will be in their prime. Already the sun is lower giving longer shadows and bringing shape and texture back to the fells. There’s an overall warmth to the light bathing everything in a cosy glow while the evening air is filled with the first of the log fires. While there’s still a bit of warmth around and a good full day’s daylight it’s my favourite time of year – the landscape is at its best around now. Back in 2004 this was also the time a bunch of us like-minded artists decided to shake up art in our rural corner of England. Art in Cumbria at the time was dominated by the tourist landscape painting market. There were very few opportunities for artists to show their work outside the souvenir gallery scene. A few years previous a series of open studio events had started which began to open up the market a little. However, the open studio model only works for a distinct portion of artists – namely those who made work to sell clearly. Those who only worked to commission or outside of the commercial realm were still invisible to most people. Yet Cumbria – and the Lake District in particular – had a huge potential audience – in tourism terms second only to London in the UK. Clearly we were missing a trick. The solution as we saw it was FRED – a 10-day ‘Art Invasion’ where artists created work outside the gallery environment and brought it into the path of everyday life. It was an idea which turned into a vision which gathered pace and became something that just had to happen. So it did. The first year was done on an absolute shoestring budget. I still wonder how on earth we managed to do anything at all that first year, but we did. With no sensible budget we encouraged artists to realise projects they always wanted to do but for whatever reason had never got round to doing. By getting enough artists to do those little projects at the same time we would generate a critical mass where the sum of all that activity became a much bigger thing. Well, that was the idea. To hold it all together we needed a brand and visual identity. We wanted this to look and feel like an artist uprising. 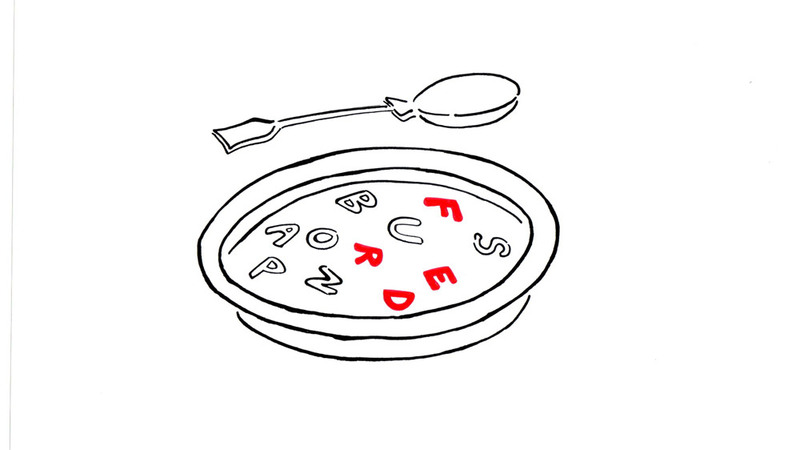 For that it was important that every detail was regarded as a work of art.We managed to persuade David Haldane – a cartoonist for The Times – to come up with a branding which would be an artwork in itself. 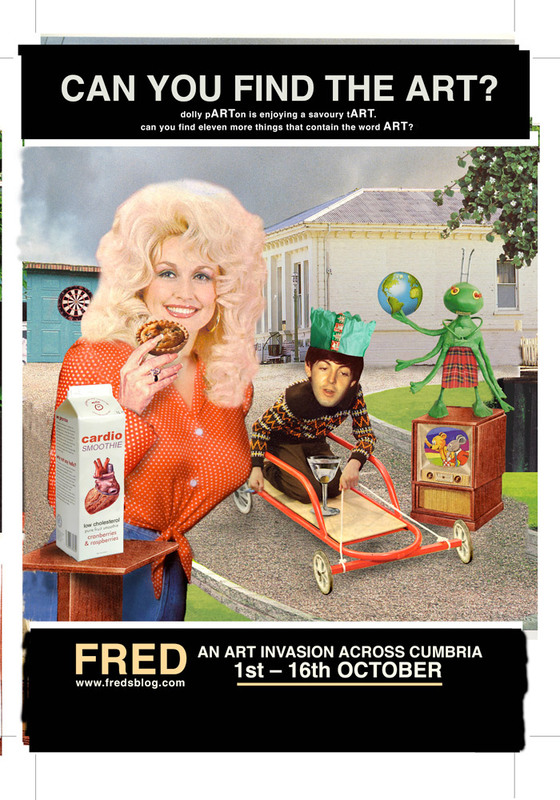 This idea that FRED was art everywhere – a bit like the ‘Humphrey’ milk marketing campaign in the ’70’s. Davids FRED cartoons became postcards and stickers and spray-painted roadside placards. We also managed to secure the unused advertising space on the back of car park tickets right across the main tourist spots in the Lake District. Adele Prince was commissioned to create a series of artworks which turned car park stickers into artworks – not advertising. It was all very low-fi and more than a little anarchic. But something happened. On the very first day the BBC news picked up the story of the parking ticket artworks and the ‘outdoor art festival in the Lake District’ and ran it on the half-hourly news slot on the ‘Today’ programme on radio 4. Probably the biggest radio audience in the UK. By the end of the day every BBC radio station in the country had phoned me up, followed by regional TV and a couple of national newspapers. It even made the front page of the local newspaper. This might not seem a big thing, but art NEVER featured on the cover of the Herald, let alone crazy contemporary art. 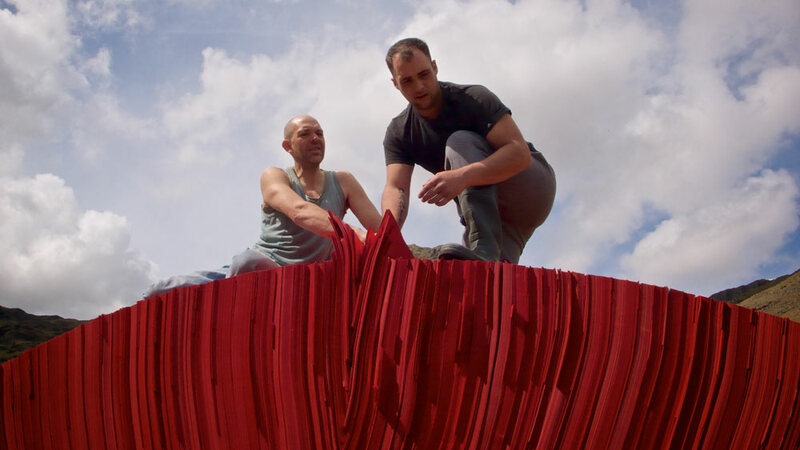 Around 40 artist – some alone, some as groups – created temporary projects all over the county – from park benches to railway stations, dry stone walls to shops. We even had piece in the tiger’s enclosure at the zoo. The media coverage alone far outweighed anything that had ever happened art-wise in Cumbria before. Bigger than most stuff outside London even. The Arts Council were a bit embarrassed at its success having turned it down for funding and so suggested doing a book on it to get their logo somewhere. Following on from the success of the car park tickets we wanted someone to do something on the back of till-roll receipts at the service station on the M6. 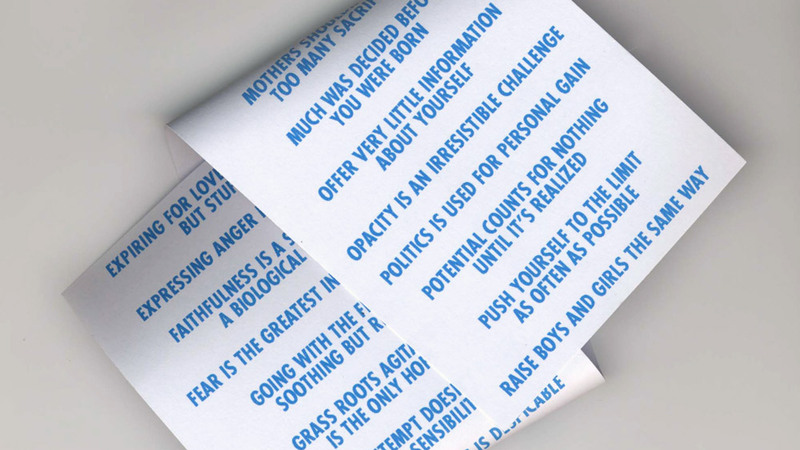 A couple of probably quite cheeky emails enlisted fellow rural-based artist Jenny Holzer to create a coupe of new works. 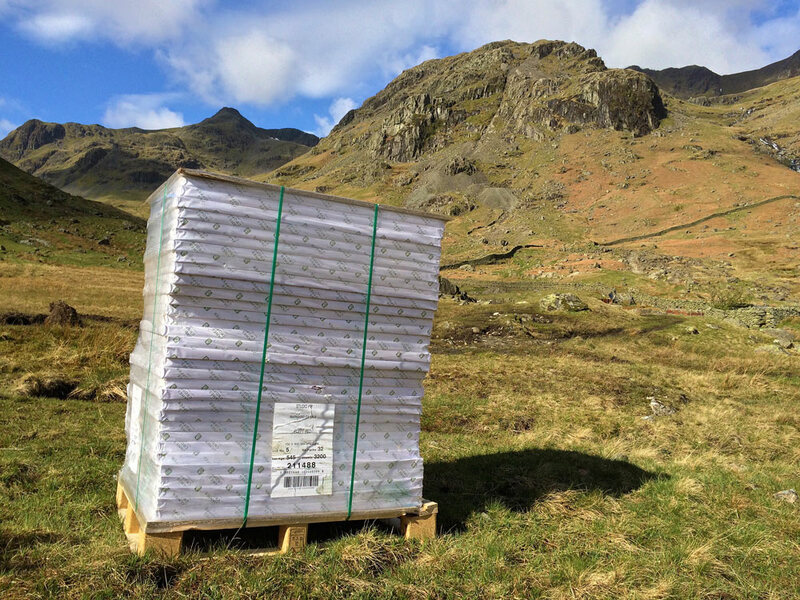 The new versions of Truisms and Survival Series as ‘For Cumbria’ appeared on the back of over half a million receipts over the 16 day festival and helped attract more serious arts coverage in the national press. Whilst the ambition and profile of the festival grew year on year, the budgets didn’t really. The marketing commissions remained the only paid commissions. All the other projects were only paid travel, accommodation and materials expenses. As such they weren’t commissions and the artists consequently had complete artistic control. Despite that each year we waded through up to 500 proposals from all around the world and whittled it down to just 30 or so projects. On top of expenses covered we also provided the artists with project management, marketing skills training and got them the audience and exposure many public funded galleries only dream about. The whole event was one big learning experience for everyone involved. An annual contemporary art event like this had not been done before so we had no one to learn from except ourselves. Over the years we developed and refined the programme always looking to see what worked best and what failed completely. What worked best year on year was being able to take risks and exploiting the untapped potential of the rural environment. Scale was one of the biggest assets. We could do things that even the Turbine Hall at Tate Modern would struggle to cope with. Engaging with the landscape was more than just about the visual presence. The experience of landscape was just as powerful. For some of the really remote pieces that journey to get to them was all part of it. The complete lack of light pollution preempted the ‘Dark Skies’ projects and illuminated artworks took on a whole new level of engagement with their surroundings. However, we never tired of the opportunity to take risks. The very human connection you get working in small, often isolated communities, meant it was easy to find like-minded souls who welcomed and even encouraged real subversiveness and damn right cheek most art institutions would never get away with. FRED was more than just about spectacle or art in beautiful landscapes. It was also about local issues and connecting with the people who live there. The real rural issues overlooked by the urban media and politics – public transport (or lack of), disappearing petrol stations and libraries, Eastern European wagon drivers, the decline of upland farming. FRED wasn’t just about tourism, at its heart was engaging and speaking alongside rural communities. This wasn’t about trying to replicate an urban notion of contemporary art. It was about finding a rural voice – doing something that simply cannot be done in any city anywhere. It was about being rural and proud of it. FRED’s strength came from looking outward rather than within. 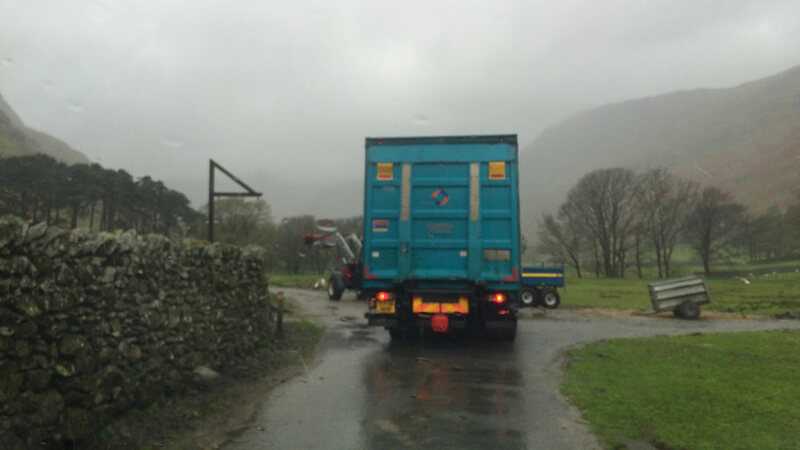 Projects weren’t restricted to the geographical boundaries of Cumbria. There were plenty in all the neighbouring counties and even one running in Bavaria one year. So many rural initiatives suffer from being too parochial. Less than a quarter of the artists came from the county. By the final year there were more proposals from overseas than from NW England. I guess to an overseas artist the draw of travelling abroad and creating a piece in stunning landscapes and having all your expenses covered is quite strong. Rural issues are similar around the world also, and the ability to voice them anywhere is rare. But that mix of the local and international often ended up strengthening everyone’s work. Doing an event working with up to 80 artists in maybe 60 locations over 2,600 sq. miles, every year is a huge undertaking. I certainly didn’t do it single-handed. There was a team of 5 or 6 dedicated artists every year working ceaselessly for what little crumbs we had to spare. All doing their bit and without who it would never have happened. But the funding was never right. In five years of bringing in thousands of people contributing hundreds of thousands to the local economy each year on top of developing the contemporary art environment in Cumbria, we never received a single penny from the County Council. Only in the final year did any of the local councils contribute more than £100. Raising the money was a year round job – each festival took 18 months to fund, plan and organise. The lack of enough money meant I was also creating all the print design, building websites documenting half the works and reinvesting my own money just keeping the thing afloat. After five non-stop years it was decided to call it a day and quit while we were still on top. Initially the excitement and momentum kept me going, but after all those years it left me physically, mentally and financially broken. FRED finally finished in October 2008. FRED was a product of its time – the right people in the right place with the same idea. It happened but there’s no going back. I doubt anything like it will happen again in the same place. Behind the scenes it ended up in such a messy way I’ve deliberately avoided looking back at it for years. However, wherever I go people still speak highly of it – both local people who remember the mad things that happened in their village and rural communities around the world in awe of its energy and ambition. Over the past few months I’ve finally come round to being able to look back on it and see all the things it done. It may not have generated any Turner Prize winning art – it was far too anti-establishment for that – and it was always a bit ragged around the edges. But it was raw and real. And that glorious early autumnal light made it just look amazing. It feels like ages since I last posted something here. Actually it was ages. It’s been an eventful summer – lots of new work getting made and going up all over the place, amazing weather to distract me, and … oh, I moved house. Moving house is a stressful thing at best of times – when you’re self-employed and you have to move house in the middle of lots of work it seems doubly so. My six years on a mountain was an amazing adventure. Stainmore is not exactly known for its sunshine and warm weather. In fact quite the opposite. Four out of the last five winters have been especially hard up there. At around 1,500ft above sea level snow was pretty much a given. Most years I’d find myself snowed-in for a total of five weeks – that’s 10% of the year when you couldn’t get within a mile of the house by car. Yet, somehow I felt endeared to that bleakness and solitude. No double-glazing, no central heating and a coal-fired cooker. It was never going to be easy. But the clouds and the wind and the curlews and seeing hares on the track most days and listening to the owls at night… it was a truly special place. But it’s a very different view. Obviously it’s not as high up as the one on Stainmore. It’s still got those wild North Pennine fells though at the moment – probably because it’s still summer, they don’t do very much yet. The biggest difference is trees. I had trees on Stainmore. The owls used to sit in them at night and call to each other. 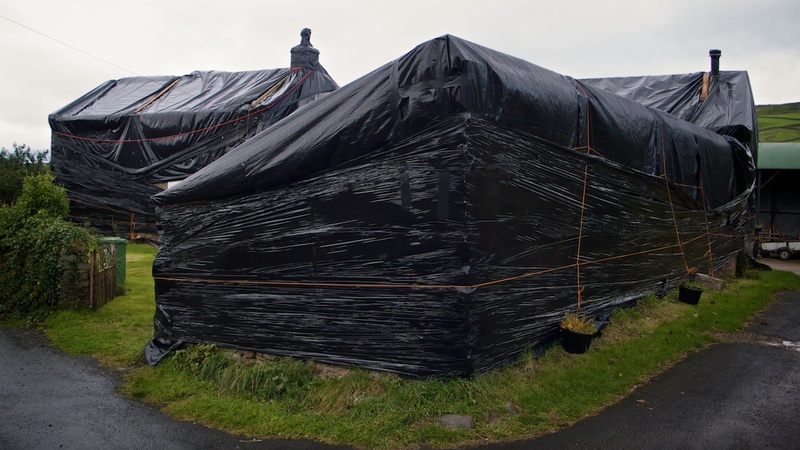 They also protected the house from the worst of the northerly winds. But there weren’t very many of them, and there weren’t many to be seen in the view either. Here in Teesdale, there’s a lot more of them – little copses and big woodlands. Mostly deciduous too – I’m hoping for an autumn like last year. That would be amazing. And they don’t just make the landscape look different – it sounds different too. Stainmore was all curlew and lapwing – alien sounds in the bird world. Here, there’s still the odd curlew cry, but there’s much much more variety of birdsong. Yes, birdsong. That’s what was missing before. Tweets and trills and swoops and chirps. So many different sounds and it’s always there. The trees seem to act as some kind of filter removing much of the background noise, but somehow the birdsong still cuts through. The other week was haymaking in the dale. The current rules on farming in this Environmentally Sensitive Area (ESA) mean that many farmers have very short windows to harvest hay and silage and it seemed like the entire valley got harvested in a matter of days. One of the local contractors was using some beautiful old machinery to make square hay bales. There was a wonderful rhythmic pattern circulating around the fields as the machine scooped up the hay, compacted it, tied it into bales then stored then gathered them up to be deposited in convenient piles to dry in the sun. Of course I never went out with any sound recording stuff to capture all this while it’s still new and exciting to me, so for now they’ll just have to be memories. The other sound that somehow manages to carry on still evenings is from the water cascading down the falls a couple of fields away. ..but that’s for another story. It’s been another sitting-outside-with-a-cup-of-tea kind of day today. Even up here on the side of my mountain it’s pleasantly mild. There’s a quite a stiff breeze, but not a chilling one, and the air is spectacularly clear all day. One of the most special things about my time living up here has been the view. It’s always there in one form or another and has provided all the header pictures for this blog. 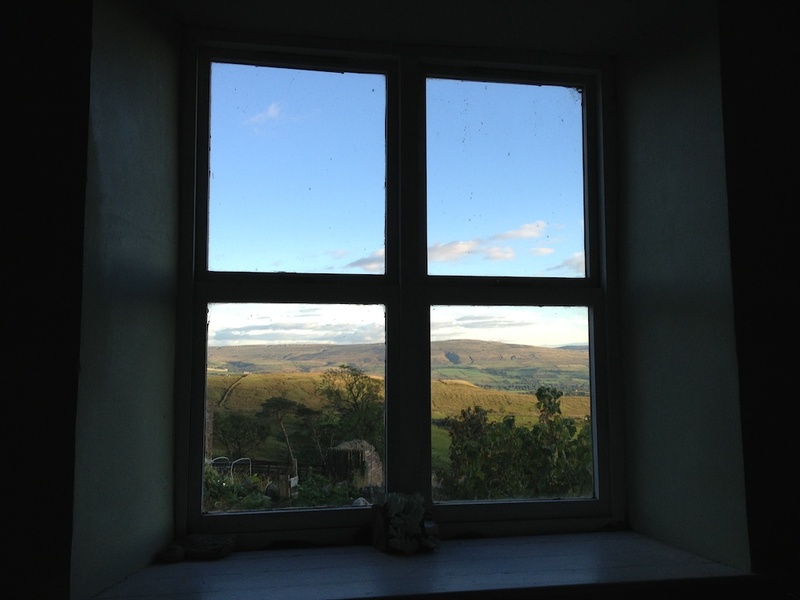 All lazy views – just taken from the doorstep. No effort required. There’s something quite captivating about extensive views. There’s so much information in them – so much detail – and as a living landscape you can invariably see little vignettes of other peoples’ lives. The cyclists punishing themselves up the hill, the game keepers whizzing around on their quad bikes, the distant sound of a siren. Sometimes even the sound of a train (10 mies away – that’s impressive). Closer up there’s sheep and cows in the fields. Always pheasants. This time of year there’s dozens of swallows darting around and tweeting in the barn, curlews, buzzards and crows on the wing and tiny, scruffy lapwing chicks wandering around aimlessly. This sense of pleasure and serenity from just sitting in the garden seems such a natural reaction to what’s around. Like something pre-programmed into our genes. But that’s not the case. Step forward the Lake District. 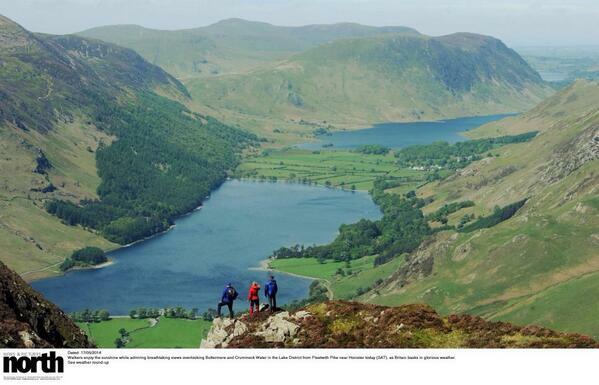 This is how many people – millions annually – see the beauty of the lake district every year. Lakes and mountains (and sunshine – somehow). Millions venture up the fells each year to get these kinds of views over the lakes and mountains beyond. There’s a whole tourism industry built around this employing thousands and propping up the rural economy in otherwise isolated communities. Three hundred years ago, no-one came. There were no tourists. Cumbria was a wild and forgotten corner of the country. Had been for centuries. Famously the doomsday book never got this far. It was considered inconsequential and untamed. Not worth going to even to find out what was there. Landscapes too were just what was there. An obstacle to negotiate between places mostly. In art the idea of painting little watercolours of the view was years aways. 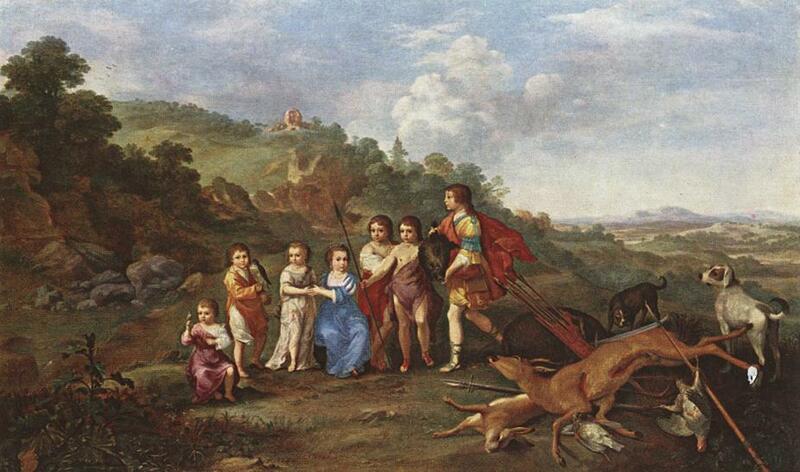 Landscape painting was either a backdrop for dramatic stories or a document of a patrons’ wealth. Land ownership was power and importance. 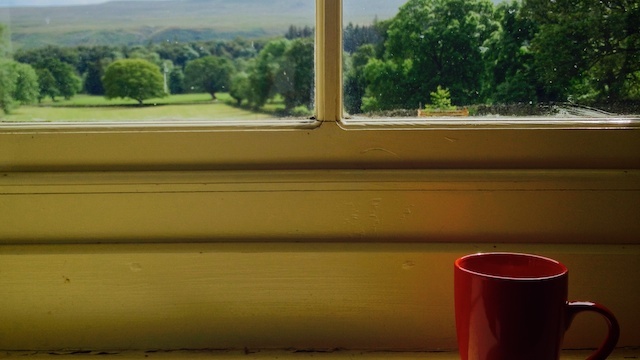 So, when an unknown clergyman from Glasgow visited the Lake District and was blown away by its natural beauty, this was a truly radical moment. 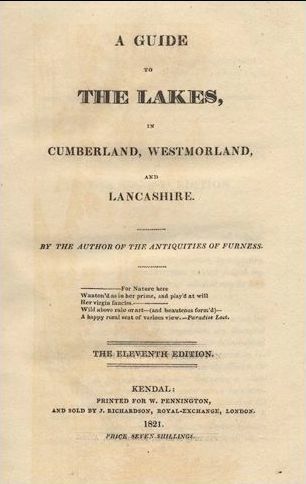 Thomas West’s 1779 ‘Guide to the Lakes of Cumberland, Westmorland and Lancashire’ was more than just a guide book around sites of roman antiquity, it kickstarted ‘tourism’ in the UK and brought thousands of people out of cities to experience this radical new way of looking at the world around them. In Thomas West’s day the mountains were still out of bounds for sane and ordinary people. They were just ‘scenery’ – a backdrop to offset the beauty of the lakes themselves. However, the burgeoning picturesque movement rapidly embraced the aesthetic qualities of the distant fells as part of the overall aesthetic. The wild and untamed mountains were frequently described as ‘terrifying’ and ‘awful’ in a way that added tension to the landscape view. It was the romantic movement that brought us the human connection with landscape that we take for granted today. Born from the seeds of the French Revolution, it was a reaction to the pace of change that was sweeping Europe which brought artists and thinkers to seek solace in the basics of human existence. Forging an emotional link between us and the natural world around us. Although it was primarily a German and French ideology, it was writers like Wordsworth and Coleridge who created a centre for romantic thinking based on the landscape of the Lake District who really cemented this idea that some landscape views were more beautiful than others. That views could in some way be special things in their own right. While at the new house at Allan Bank in Grasmere, Wordsworth was instrumental in shaping the grounds to work in harmony with the natural landscape. One of the most ambitious features was a dramatic viewing tunnel through a hill. 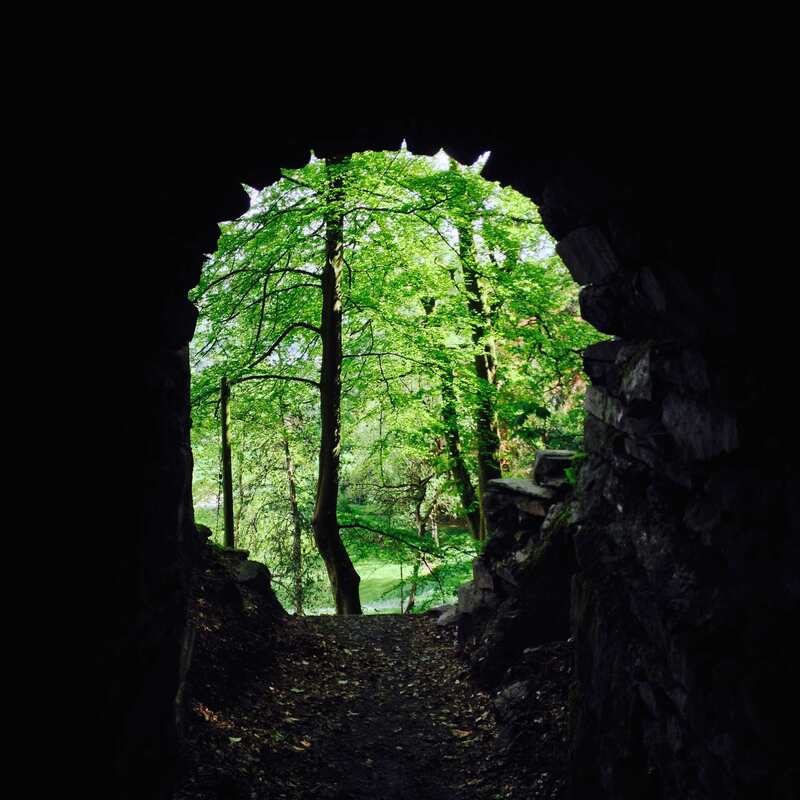 The short stone lined tunnel had a slight bend in it, so that on entering from one side you were venturing into the unknown, only by half way through to be presented with a composed view over the lake below. In the 19th century, viewing the landscape became big business. Turner and Constable battled it out at the Royal Academy summer shows with bigger and more impressive landscapes. Viewing points became tourist attractions in their own right – many having pavilions built to frame the view. 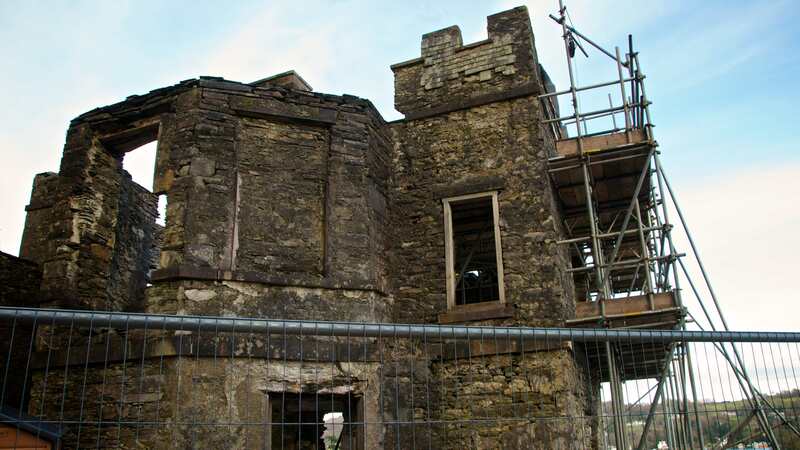 The ruin at Claife, on the western side of Windermere is a particularly impressive example of the fad for viewing. A three story building with rooms for entertainment overlooking the lake. The drawing room was famed for its very contemporary take on viewing – each of the windows was tinted with a different colour to simulate the seasons – yellow for summer, orange for autumn, green for spring and a pale blue for winter. A deep blue simulated moonlight and a lilac window represented the light in a thunderstorm. There’s little remaining of the building today, and all those viewing windows are long gone. It must have been quite an amazing experience. In 2011 Olafur Eliasson created ‘Your Rainbow Panorama’ in Århus, Denmark. A 360 degree panorama over the city where you view through a complete spectrum of colours. A thing of beauty, but one which existed in Cumbria over 200 years earlier. Claife isn’t the only example of real cutting edge art-architecture. A full one hundred years before the picturesque took off, the owner of Rydal Hall, between Ambleside and Grasmere, took a radical view to landscaping the gardens. 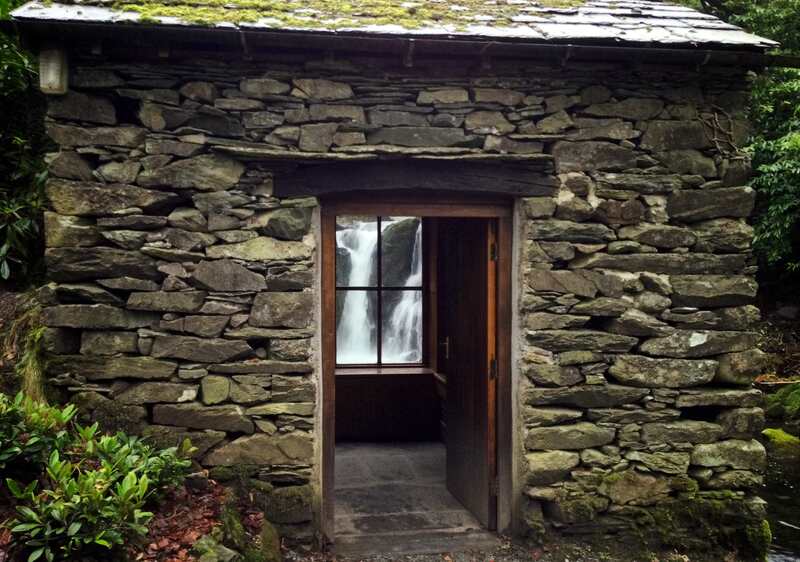 One of the most important features i this was the ‘Grot’ – a little summerhouse built at the foot of a waterfall on the beck running through the grounds. A path leading to the Grot, twisted and turned creating a series of hidden ‘reveals’ – composed little set pieces. The end of which was this little hut by the water. As soon as you opened the door, the waterfall was revealed through the window on the other side – framing it as a living picture. Like all great cutting edge design, this little hut drew thousands of people from all over the country including Gilpin (credited with formalising the concept of the picturesque), Constable, Turner, Joseph Wright, Ruskin and all the romantic poets. It also featured in West’s guide. 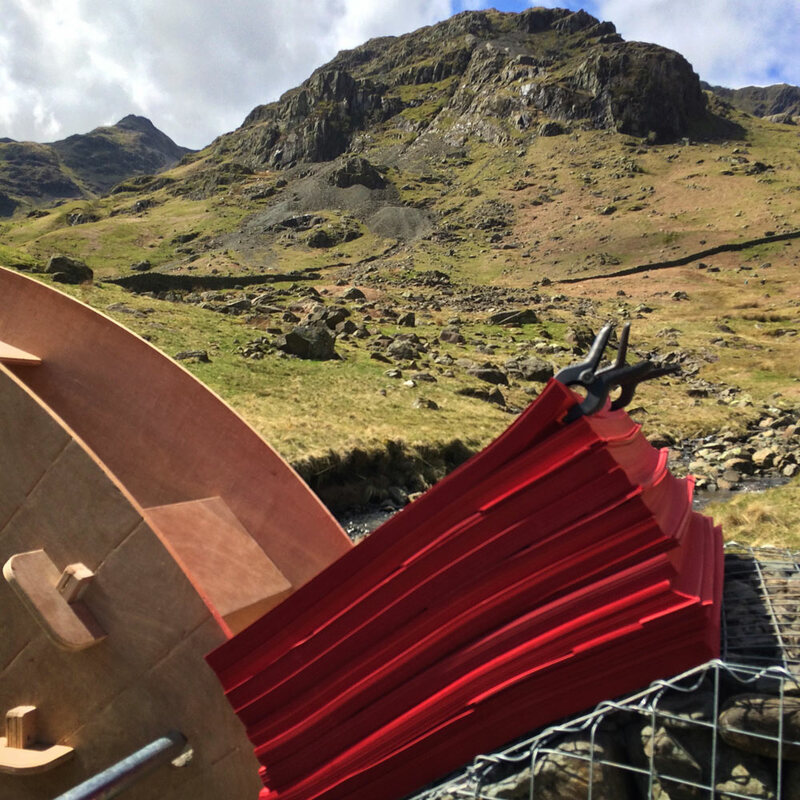 This week I’m installing some new pieces in the Lake District. It’s been a while since I last did anything large-scale there. While I personally prefer the bleak and wilder landscapes of the North Pennines, there’s something about those lakes and mountains that I enjoy exploring and working with. To be part of that ongoing narrative about looking at and experiencing the world around you – maybe its because its at the core of my own work that it feels so resonant. But maybe it’s because if it hadn’t been so inspiring to Thomas West all those years ago, none of us would be sitting outside simply admiring the view.